It’s still August but you can feel fall in the air. Usually it’s in the morning when the lows have moved into the 60s and there seems to actually be dew on the grass. Though, in this dry climate it’s probably just unevaporated moisture from the night-running sprinklers. This change in seasons means one thing; the fall Lifelong Learning catalog is coming. Actually, it’s here! You should be receiving it shortly in the mail and if you don’t, you can always find it online. 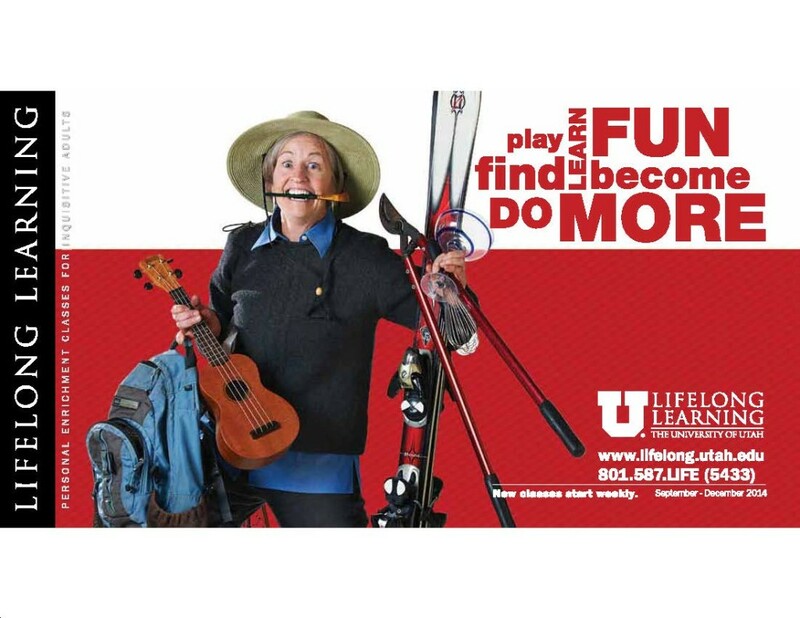 If you aren’t familiar with Lifelong Learning at the University of Utah, you should be. They pride themselves on offering personal enrichment classes for inquisitive adults ages 18 to 118. We aren’t talking about the dreaded college calculus or that English class that you took three different times and never got better than a C in. These classes feed your quest for knowledge, your quest for something new and different and yes, they actually feed your belly in some instances. You can learn a new craft, a new skill, a new hobby or expand your knowledge in countless areas. On top of it all, the classes are FUN, because you actually WANT to be there! Lifelong learning taps into local celebrities, experts in their field and people like your neighbor who grows an amazing garden, to teach their classes. These people in turn share their knowledge and enrich your mind; this fall they are offering several new classes and a bevy of returning favorites in their lineup of over 140 classes. Everything from photographing galaxies in astrophotography to tasting whiskey from around the globe with Jim Santangelo. Old Time Fiddling, Sign Painting, Meditation, Acupressure, Fermenting, All About Coffee with Levi Rogers of Charming Beard Coffee, Wine Tasting with Sheral Schowe, Palm Reading with Margaret Ruth and much much more. I personally will be sharpening my ukulele playing skills, learning more about night photography and baking croissants with Romina Rasmussen of Les Madeleines Patisserie. I only wish I had more time because there are about 15 classes that I have dog eared to take. andrew@slcurban.com Andrew works days as the Program Developer for Lifelong Learning at the University of Utah, is a Realtor by evening, a father at all hours and an Urban Farmer who raises lots of vegetables and 10 lovely chickens. In his spare time he maintains several blogs, does web design and curates content for his site 365 Things To Do in Salt Lake City and it's related Facebook Page. Andrew came upon this hectic life when he left the world of hotel and restaurant management and his career of over 20 years. Why? For a simpler life. Why else? "Earn less and enjoy life more" has been his motto ever since.